Victoria Strauss, author of COLOR SONG, discusses fascinating old maps and ingenious young women. 1 Victoria Strauss, author of COLOR SONG, discusses fascinating old maps and ingenious young women. What is your favorite thing about COLOR SONG? I wanted to continue Giulia's story (begun in PASSION BLUE), and show how it might be authentically possible, even within the narrow conventions of 15th century Italy, for a woman of talent to transcend strict gender roles and follow her passion. 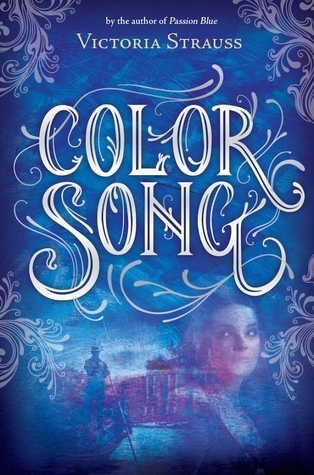 I'm also fascinated by stories of women who disguise themselves as men (such as the surprisingly large number of women who fought as men during the Civil War), and COLOR SONG gave me the chance to incorporate that interest into a book. Including research, about a year and a half. COLOR SONG is my ninth published book. I've lucky in that I've never completed a book that hasn't been published (though I've started and abandoned several). It took me a very long time to sell my first novel, a YA historical called THE LADY OF RHUDDESMERE. I wrote it when I was 17, during a year off between high school and college, and queried sporadically over the next few years without success (my query letter was really awful; that may have had something to do with it!). By sheer luck, my manuscript landed on the desk of an editor who was in the process of switching careers to become an agent, and she took me on as one of her first clients. Initially she wasn't any more successful than I had been, but she never gave up, and six years after she took me on--and nearly ten years after I wrote the novel--LADY was finally published (in much-revised form). I'm still with the agency, and LADY, which has been out of print for many years, is about to be be re-published. My writing ritual mainly consists of procrastinating until guilt forces me to my computer...But seriously, I start work in the morning, take a break for lunch and exercise, and continue until dinner. I work at my laptop in the dining room (my office, with its reminders of bills to be paid and emails to be answered, is too distracting) and I use a little program called Freedom that shuts off the Internet for whatever amount of time I plan to be writing. I prefer silence--music is also too distracting--and solitude, except for my two cats, who love to help me by lying on my keyboard. Educate yourself! Take the time to learn about publishing and self-publishing before you take steps to get your work published. There are so many pitfalls for writers--writing scams, unqualified editors and literary agents, amateur publishers, bad contracts. The more you know, the better you'll be able to protect yourself, and the better decisions you'll be able to make. For the past few months I really haven't been working on anything--there's an illness in my family and it's taking up a lot of my time and energy. But I'm trying to carve out space to plan another YA project, including doing preliminary research. I have two ideas in mind--now I just have to choose! Enter here to win signed copies of COLOR SONG and PASSION BLUE! Giveaway ends on 9/21/2014 at midnight EST. Victoria Strauss is the author of nine novels for adults and young adults, including the Stone duology ("The Arm of the Stone" and "The Garden of the Stone"); the Way of Arata duology ("The Burning Land" and "The Awakened City"); and "Passion Blue" and "Color Song," a pair of historical novels for teens. She has reviewed books for SF Site, Black Gate, and Fantasy magazine, and her articles on writing and how to get published have appeared in Writer’s Digest and elsewhere. In 2006, she served as a judge for the World Fantasy Awards. She is an active member of the Science Fiction and Fantasy Writers of America (SFWA), and co-founder, with Ann Crispin, of Writer Beware, a publishing industry watchdog group that warns about literary schemes and scams. She maintains the Writer Beware website, blog, and Facebook pages, and she was honored with the SFWA Service Award in 2009.